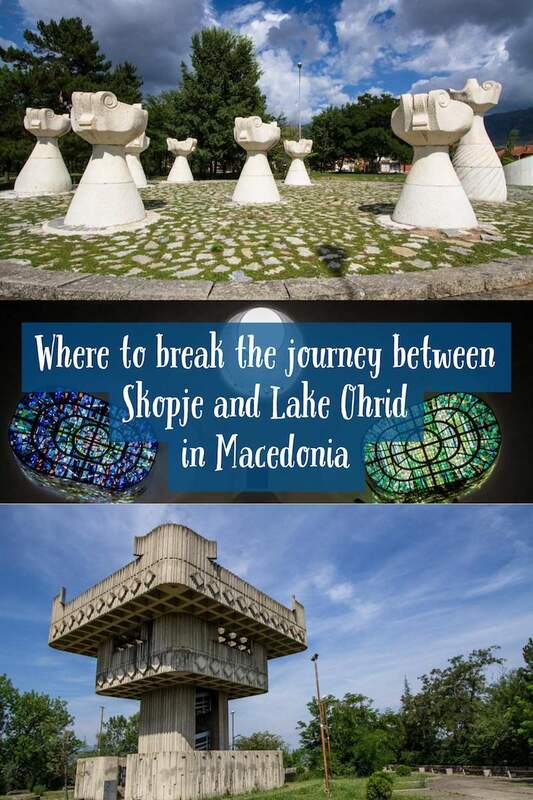 Interested in seeing some smaller, less-visited cities and towns en route between Macedonian’s outlandish capital and its jewel in the crown, serene Lake Ohrid? 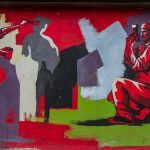 Although you can get between the two places in a little over three hours by public bus, we spent about a week doing the journey in the summer of 2017 and apart from the heat (it got up to 40 degrees Celsius at times), it was thoroughly enjoyable and below is the lowdown on what we discovered. Admittedly, our primary goal was to see as many spomeniks (Tito-era World War II memorials and monuments) as we could but that’s not to say we didn’t see and do other stuff as well. We visited ancient ruins, did some brilliant hiking and found the odd abandoned building to explore. And of course we spent plenty of time doing that most Balkan of activities, that is to say sitting around in cafes drinking extremely cheap booze and eating our body weight in cevapi (mini sausages accompanied by flatbread and onion)! 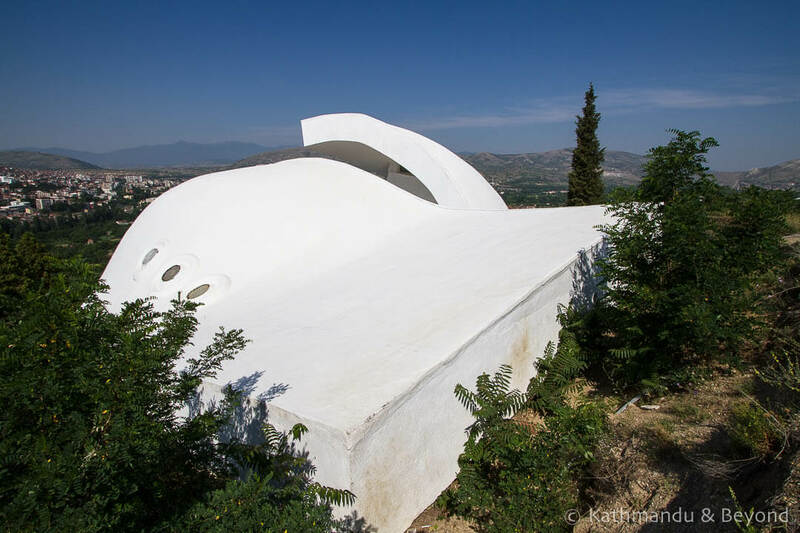 Initially heading out of Skopje in a southerly direction (on the main highway to Greece) and using BalkanViator as our guideline for bus schedules, these are the places we visited. Veles is only 50km south of Skopje. 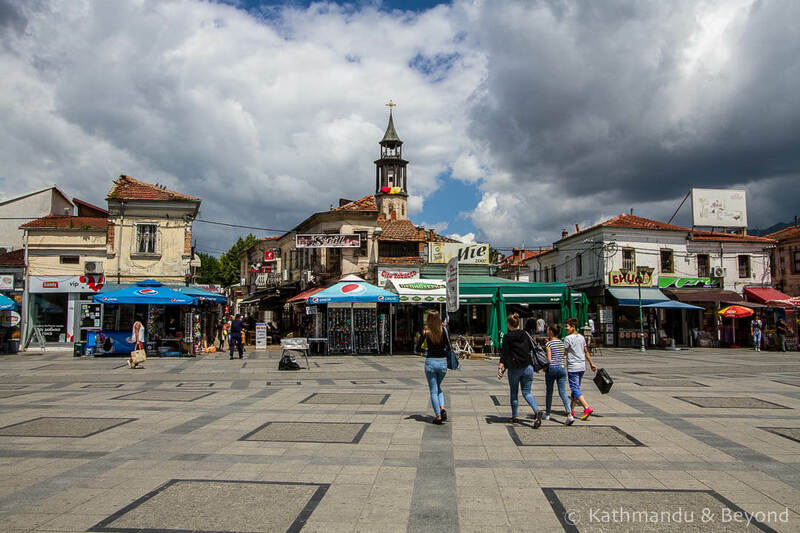 The city doesn’t really warrant an overnight stay as there is only one thing of interest to see, but Macedonia is a small country and it’s easy to get off a bus, take a look around and pick up another one a couple of hours later and this is exactly what we did. 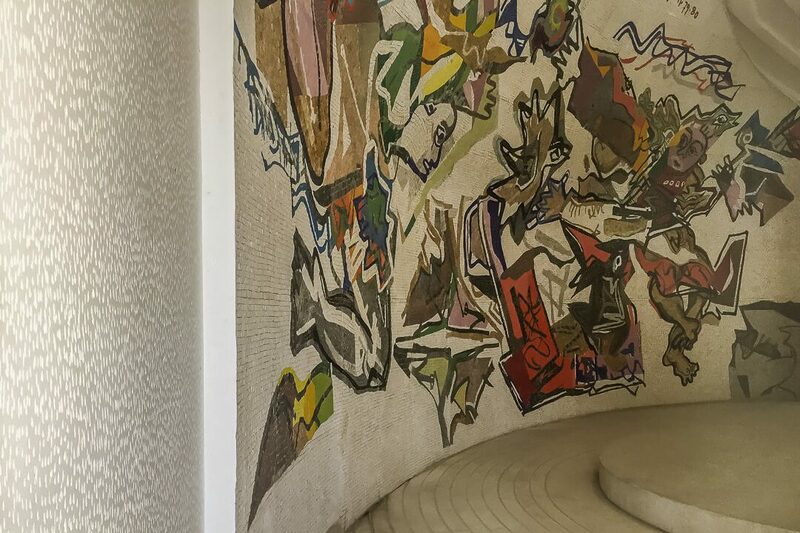 The reason we stopped here was to see the very modernist Memorial Tomb to the Heroes of the Second World War. 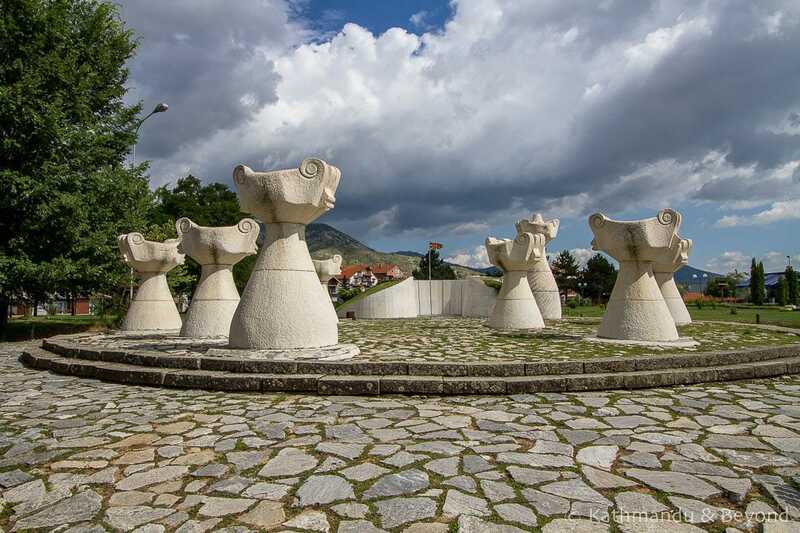 Built to commemorate partisans from the region who fought during World War II (National Liberation War), this spomenik is about a 2km walk from the bus station. 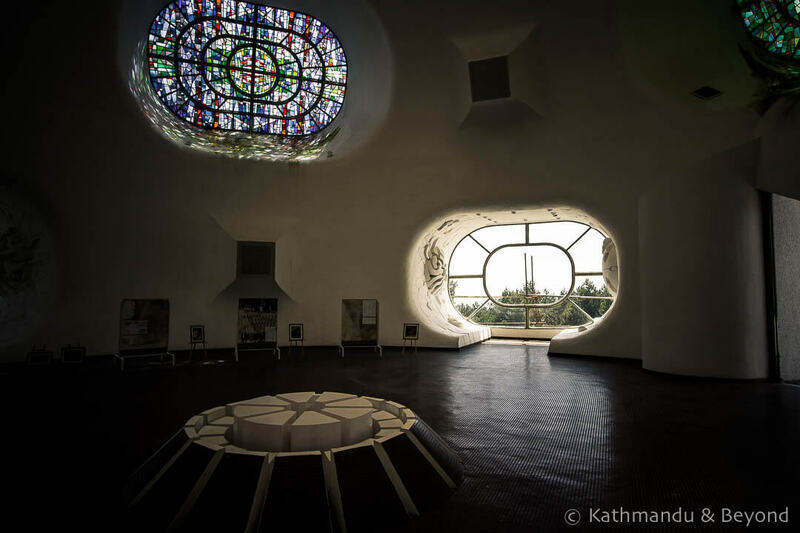 The interior was supposed to be open during the hours we visited but there was no one in sight when we arrived, so we had to make do with wandering around the exterior of the structure and peering through the windows at the murals inside, of which there are several. Unless spomeniks or this particular style of architect interests you, there probably isn’t any other reason to stop in Veles. Although having said that, the town is not unattractive and it is surrounded by hiker-attracting rolling hills. 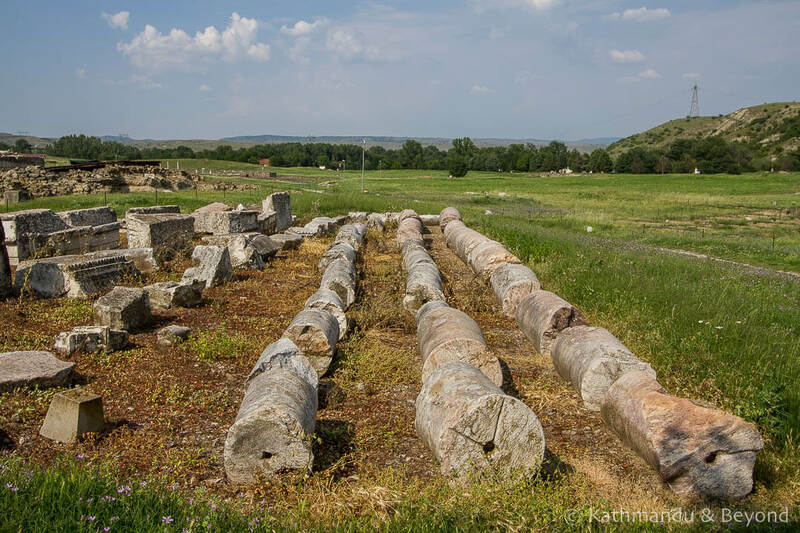 The next place of interest along the main (E75) highway is the Roman ruins at Stobi archaeological site. Sitting right next to the highway, you could, in theory, ask your bus driver to stop and let you get down but the highway is fairly busy and there is no obvious place in which to pull in so whether the driver will do it or not is anyone’s guess. Also, the main road is elevated so if you do get off the bus you will have to get down to ground level in order to reach the entrance to the site and of course you will also have to get back up again in order to catch an onward bus, assuming one will stop for you that is! All in all, it’s not a good idea. Alternatively, Stobi is only 9km from Negotino (see below) and a return taxi including waiting time of one hour only costs 500 MKD (£7, US$9.50, €8) (*). There is no public transport between Negotino and Stobi. (*) price valid as of July 2017. As for the ruins themselves, this is a working archaeological site with evidence of excavation going on all around. 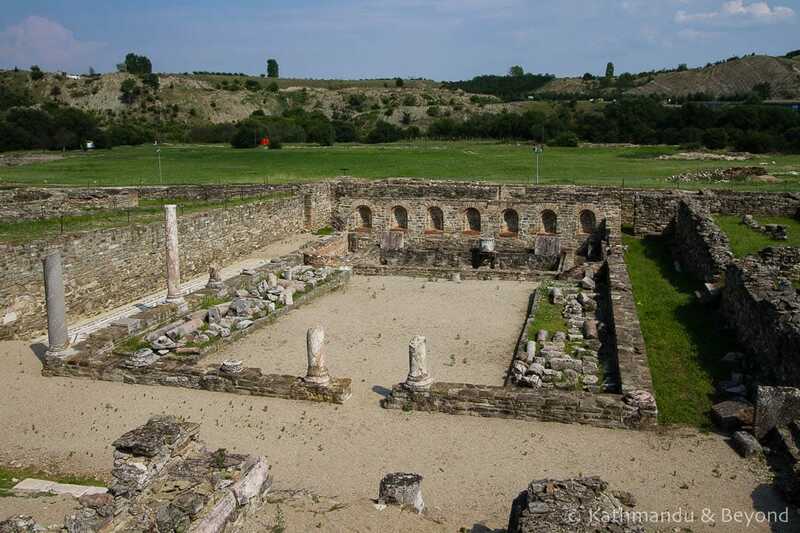 It’s not the best Roman site we have seen in the Balkans, it doesn’t compare with Gamzigrad in Serbia or Butrint in Albania (both UNESCO-listed) for example, but it is surrounded by pleasant countryside (if you blank out the highway that is!) and we had the place to ourselves when we visited so it is definitely worth seeing. More information about the site can be found here. 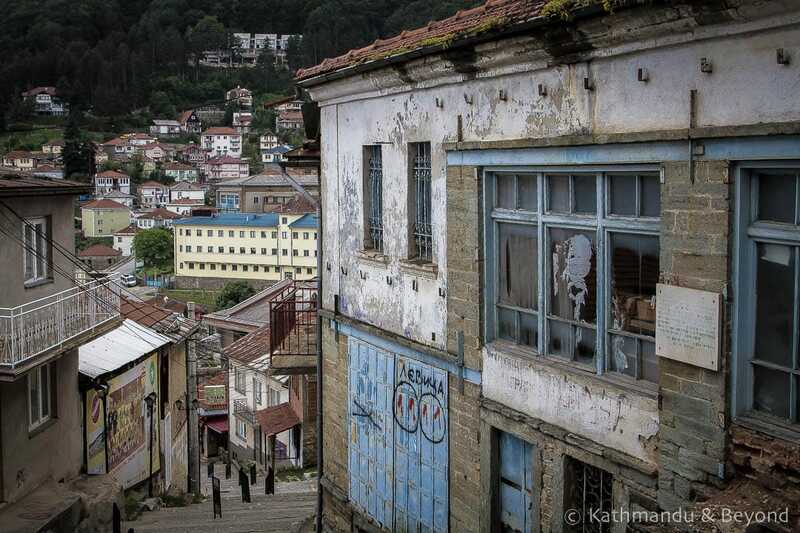 We used the small town Negotino as our base for the region but we could have easily chosen nearby Kavadarci instead. The distance between the two is 11km and regular shared taxis (which depart when they have four passengers) ply the route. What’s more, the bus to Prilep passes through both places so it makes no difference if you choose one or the other if that is your next destination. 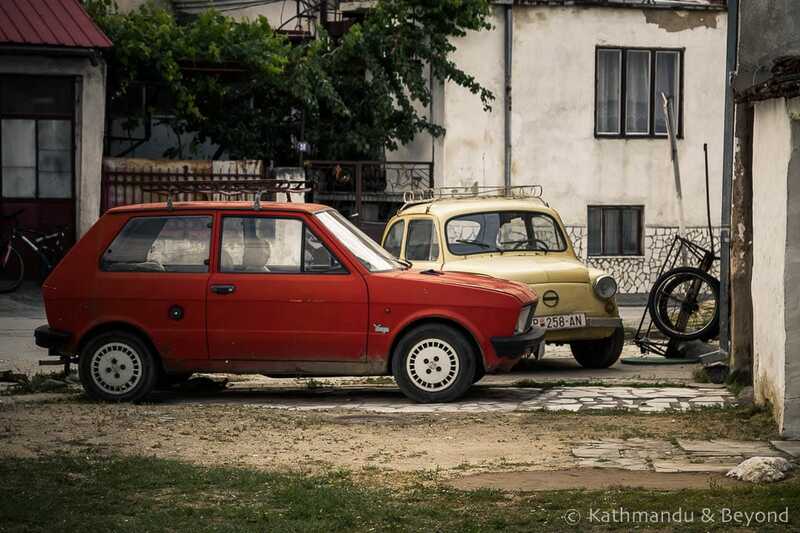 The slight advantage of staying in Negotino is that the distance to Stobi is shorter and so the taxi fare will be less but overall, we liked Kavadarci more. 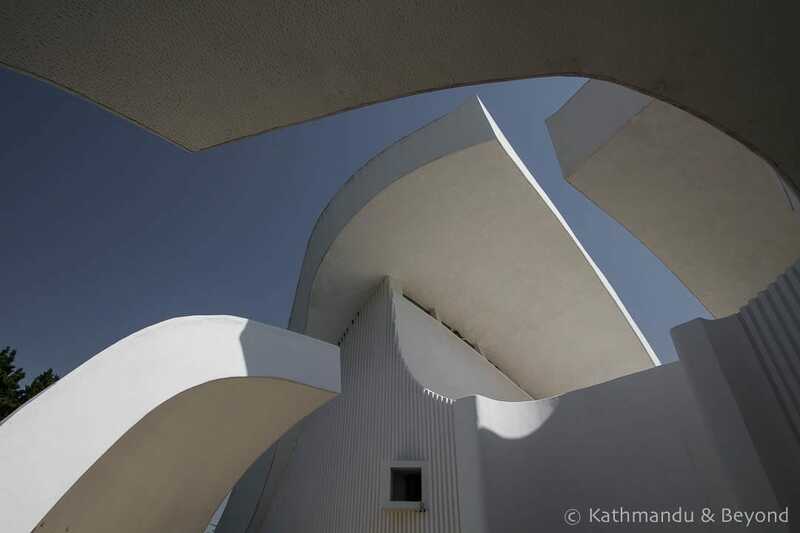 Kavadarci is also the location of the Memorial Ossuary of Fallen Fighters which, architecturally, is one of the most striking spomeniks we have seen in Macedonia. 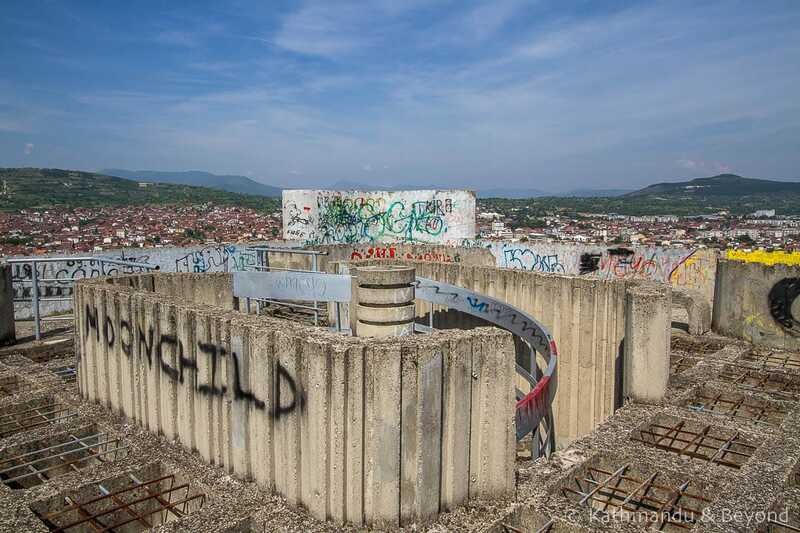 It is located in Gradski Park, a 15-minute walk from the centre of town, and we especially liked this one because you could enter it and climb to its roof for an excellent view of the city. If you are reliant on public transport or don’t want to fork out on taxis, there isn’t much else you can do in this part of Macedonia. If you have your own wheels (or are prepared to hire taxis), however, there are other activities to consider. Tikves, the plane surrounding Negotino, and Kavadarci, is the heartland of Macedonia’s winemaking industry. The most famous wine is Stobi and you can visit a number of wineries in the region (including Stobi’s) (http://stobiwinery.mk/home.nspx) but you need to be on a tour or have your own transport in order to do so. We didn’t really look into it. We are quite happy to drink the stuff but traipsing around a winery and looking at a bunch (ha, ha!) of grapevines bores us senseless but, if you are keen, it’s probably best to organise a visit in advance. There are also some monasteries, activities on Lake Tikves, and some fine scenery all within striking distance of Negotino and Kavadarci. Prilep is only about an hour and a half away from Negotino/Kavadarci but there are only three buses a day and two of them have pretty antisocial timings (0656, 0730 and 1420 (*)) so it’s best to plan and not just rock up at the bus station if you are intending to travel this route. (*) Going in the other direction, they depart Prilep at 0600, 1500 and 1600. 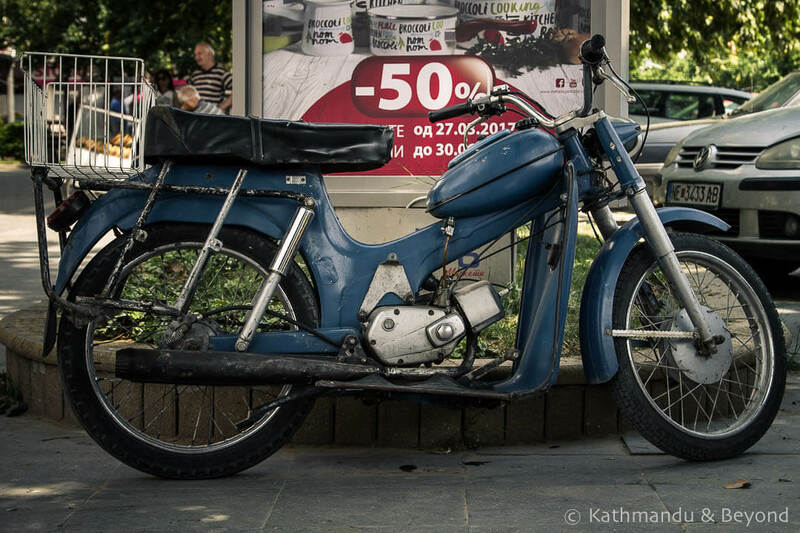 After Bitola (see below), Prilep, was the most interesting place we stopped in en route between Skopje and Ohrid. The city’s spomenik (the Burial Mound of the Unbeaten), which we thought resembled a gaggle of ducks, was especially photogenic and the old part of town, known as Carsija (Marketplace), was lively and a good place to hang out, particularly in the evening. 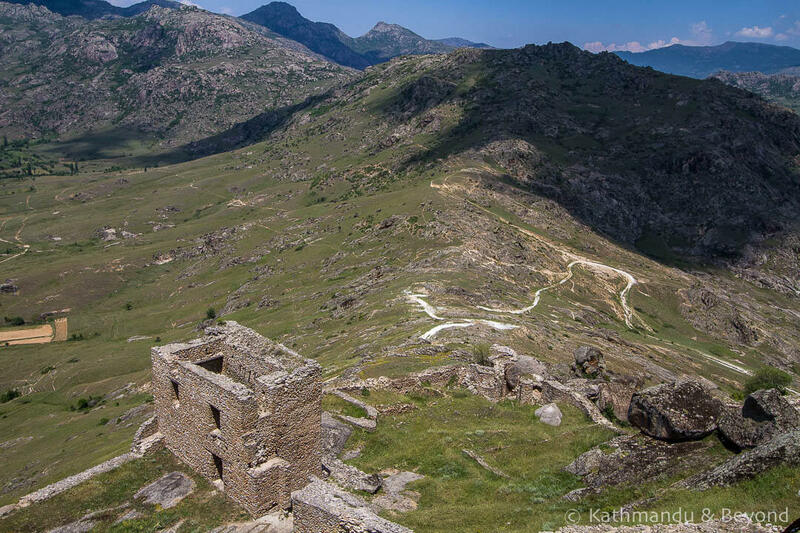 There are a couple of unusual monuments in the centre of town and we also came across an abandoned sports stadium but the highlight of our stay in Prilep was getting out into the countryside and doing a bit of hiking around Mount Zlato. 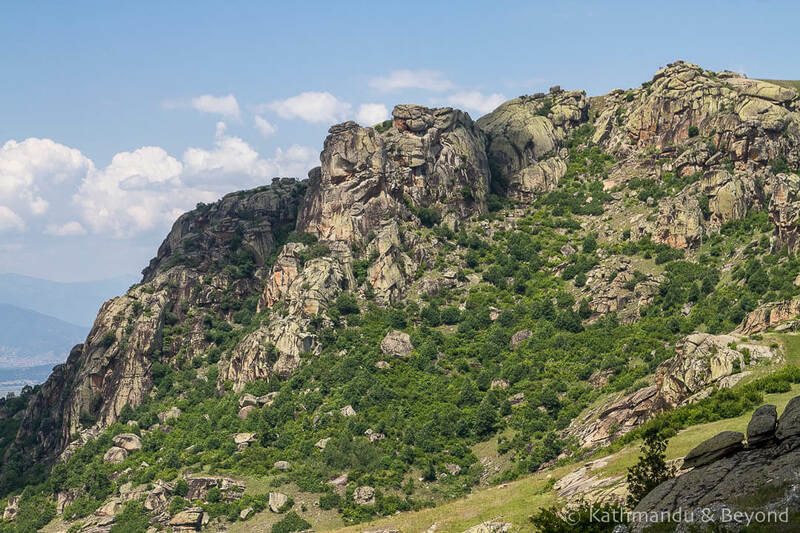 This extremely scenic walk, which takes about 3 hours to complete (excluding getting to/from the trailheads), begins at Treskavec Monastery (St. Bogorodica) and ends at Markovi Kuli (Marko’s Towers). It’s best to do it in this direction as it is then mostly downhill or on the flat. You will need to take a taxi to Treskavec Monastery but you can walk back into town from Markovi Kuli if you like, although it’s quite a way having just walked for 3 hours and catching another taxi is preferable. It’s a stupendous walk with incredible views along its entire route. 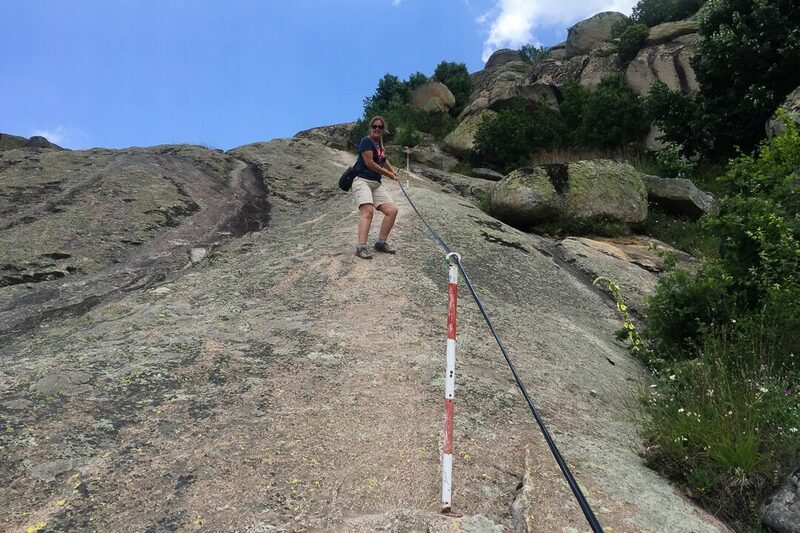 Overall, the path is well defined and there is only one tricky section when you need to use a rope to come down a rather large rock face but if Kirsty can handle it, which she did, anyone can :-). Krusevo, 30km west of Prilep, is the location of the magnificent Ilinden, or Makedonium as it is also called. 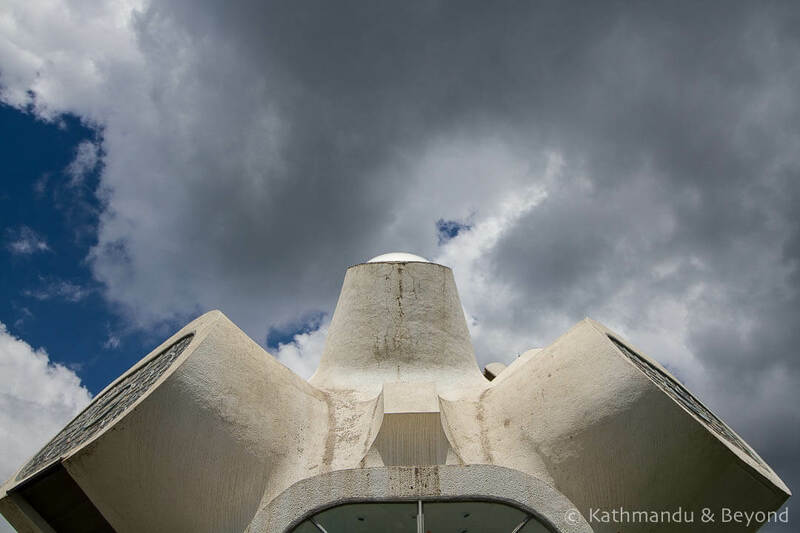 One of the holy grails of spomeniks, this futuristic-looking structure was the main reason we wanted to explore central Macedonia in the first place and although part of it was covered in scaffolding when we visited, it didn’t dampen our enthusiasm for it. As well as being dedicated to partisans who fought in World War II, it also remembers those involved in the Ilinden uprising, an organised revolt against the Ottoman Empire that took place in 1903. Unusual for a spomenik, this one has an entrance fee but that does get you inside the memorial, which is just as space-age as the exterior. The curator speaks excellent English and is a wealth of knowledge on the subject. You can even buy souvenirs at this spomenik, including fridge magnets and a mini Makedonium! Away from the spomenik, Krusevo is a gem of a place. 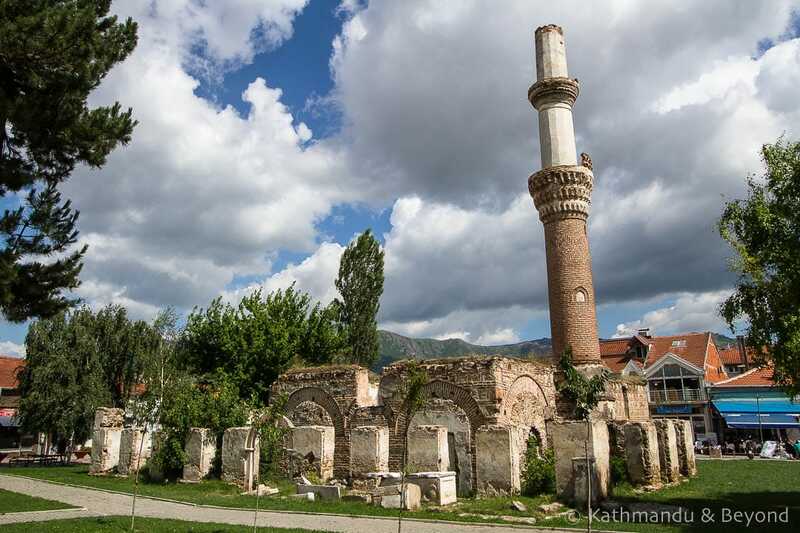 It’s the highest town in Macedonia (1350m above sea level) and its history goes back to Byzantium times. The old town is pleasant for a stroll and if you have time (we didn’t) there are some nice walks in the hills surrounding the town, including one to Toše’s Cross, some 7km away (*). (*) Toše Proeski was an incredibly popular singer/entertainer/actor who hailed from Prilep and grew up in Krusevo. He had almost god-like status throughout the region and was dubbed the ‘Elvis Presley of the Balkans’ by the BBC. He died in a car crash in 2007 at the age of 26. 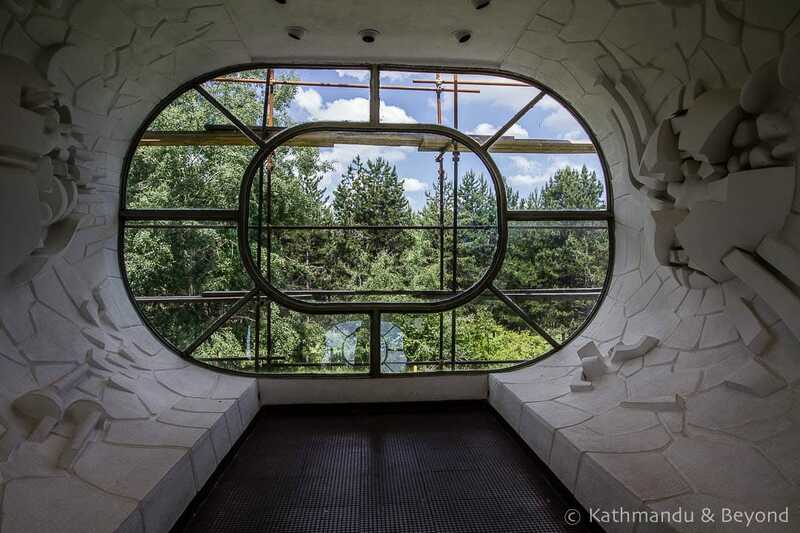 Such was his popularity and importance in Balkan pop-culture that he was given a state funeral and a memorial house near the Ilinden in Krusevo is dedicated to his memory. We visited Krusevo from Prilep. It would have been very nice to have stayed in Krusevo itself, but the town is not on the main Negotino/Prilep/Bitola bus route and connections to anywhere apart from Prilep aren’t great so it made sense to stay in Prilep instead. Regular buses connect Prilep and Krusevo and the journey time is about 40 minutes. 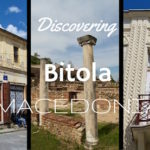 We’ve already waxed-lyrical about Bitola in a post we published in 2016 so I’m not going to add too much more here. Having seen to quite a bit of Macedonia now, this elegant city remains one of our favourite destinations. There is just about enough to keep you occupied for a day of sightseeing, what with the colourful townhouses along Širok Sokak (Bitola’s main thoroughfare), the backstreets of the Stara Čaršija (Old Town) and the ruins of the ancient Greek city of Heraclea Lyncestis, but Bitola is one of those places that is best savoured from the comfort of a coffee shop or an outdoor bar. I’ve said it before and I’ll say it again, the best thing to do in Bitola is to take it easy, relax and soak it all in! 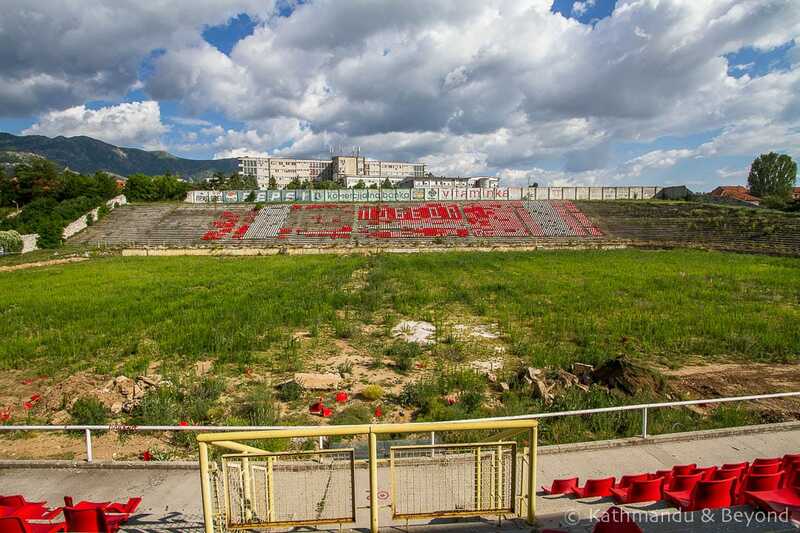 You can read more about our thoughts and impression of Bitola here. 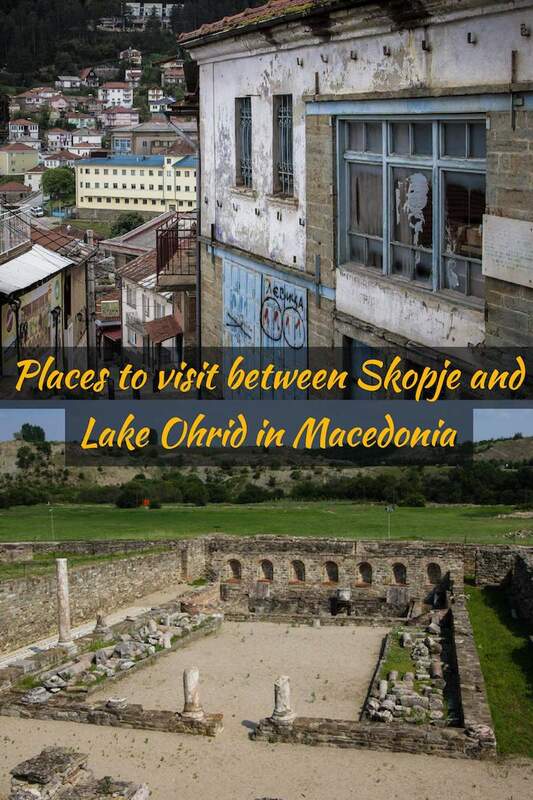 From Bitola, it’s just under two hours by bus to beautiful Lake Ohrid. Is it a region you are passionate about travelling to? Sign up for our updates and we'll let you know when we have fresh content online. 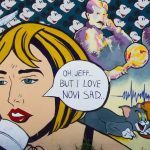 We've recently returned from our third extensive trip through the region - so will soon have lots of new inspiration and information for your next trip! We hate SPAM too! We promise to keep you email address safe and will NEVER sell it on to anyone. DID YOU ENJOY THIS POST? 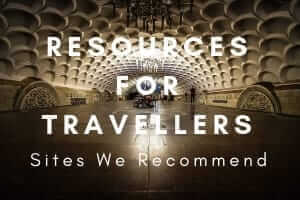 WHY NOT PIN IT TO YOUR TRAVEL PLANNING BOARD?